The International Dyslexia Association prepared this fact sheet describing reasonable accommodations involving materials, interactive instruction, and student performance to will help children with learning problems in general education and special education classrooms. Teaching students with dyslexia across settings is challenging. Both general education and special education teachers seek accommodations that foster the learning and management of a class of heterogeneous learners. It is important to identify accommodations that are reasonable to ask of teachers in all classroom settings. The following accommodations appear reasonable and provide a framework for helping students with learning problems achieve in general education and special education classrooms. 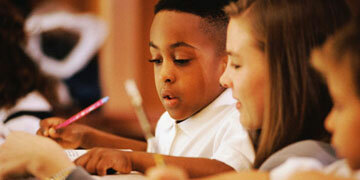 They are organized according to accommodations involving materials, interactive instruction, and student performance. (Use a tape recorder) Many problems with materials are related to reading disabilities. The tape recorder often is an excellent aid in overcoming this problem. Directions, stories, and specific lessons can be recorded on tape. The student can replay the tape to clarify understanding of directions or concepts. Also, to improve reading skills, the student can read the printed words silently as they are presented on tape. (Clarify or simplify written directions) Some directions are written in paragraph form and contain many units of information. These can be overwhelming to some students. The teacher can help by underlining or highlighting the significant parts of the directions. Rewriting the directions is often helpful. For example, one set of directions might say: This exercise will show how well you can locate conjunctions. Read each sentence. Look for the conjunctions. When you locate a conjunction, find it in the list of conjunctions under each sentence. Then circle the number of your answer in the answer column. Simplified directions might say: Read each sentence and circle all conjunctions. (Present a small amount of work) The teacher can tear pages from workbooks and materials to present small assignments to students who are anxious about the amount of work to be done. This technique prevents students from examining an entire workbook, text, or material and becoming discouraged by the amount of work. Also, the teacher can reduce the amount of work when it appears redundant. For example, the teacher can request the student to complete only odd-numbered problems or items with stars by them, or can provide responses to several items and ask the student to complete the rest. Finally, the teacher can divide a worksheet into sections and instruct the student to do a specific section. A worksheet is divided easily by drawing lines across it and writing go and stop within each section. (Block out extraneous stimuli) If a student is easily distracted by visual stimuli on a full worksheet or page, a blank sheet of paper can be used to cover sections of the page not being worked on at the time. Also, line markers can be used to aid reading, and windows can be used to display individual math problems. (Highlight essential information) If an adolescent can read a regular textbook but has difficulty finding the essential information, the teacher can mark this information with a highlight pen. Locate place in consumable material. In consumable materials in which students progress sequentially (such as workbooks), the student can make a diagonal cut across the lower right-hand corner of the pages as they are completed. With all the completed pages cut, the student and teacher can readily locate the next page that needs to be corrected or completed. (Provide additional practice activities) Some materials do not provide enough practice activities for students with learning problems to acquire mastery on selected skills. Teachers then must supplement the material with practice activities. Recommended practice exercises include instructional games, peer teaching activities, self-correcting materials, computer software programs, and additional worksheets. (Provide a glossary in content areas) At the secondary level, the specific language of the content areas requires careful reading. Students often benefit from a glossary of content-related terms. (Develop reading guides) A reading guide provides the student with a road map of what is written and features periodic questions to help him or her focus on relevant content. It helps the reader understand the main ideas and sort out the numerous details related to the main ideas. A reading guide can be developed paragraph-by-paragraph, page-by-page, or section-by-section. (Use explicit teaching procedures) Many commercial materials do not cue teachers to use explicit teaching procedures; thus, the teacher often must adapt a material to include these procedures. Teachers can include explicit teaching steps within their lessons (i.e., present an advanced organizer, demonstrate the skill, provide guided practice, offer corrective feedback, set up independent practice, monitor practice, and review). (Repeat directions) Students who have difficulty following directions are often helped by asking them to repeat the directions in their own words. The student can repeat the directions to a peer when the teacher is unavailable. The following suggestions can help students understand directions: (a) if directions contain several steps, break down the directions into subsets; (b) simplify directions by presenting only one portion at a time and by writing each portion on the chalkboard as well as stating it orally; and (c) when using written directions, be sure that students are able to read and understand the words as well as comprehend the meaning of sentences. (Maintain daily routines) Many students with learning problems need the structure of daily routines to know and do what is expected. (Provide a copy of lecture notes) The teacher can give a copy of lecture notes to students who have difficulty taking notes during presentations. (Provide students with a graphic organizer) An outline, chart, or blank web can be given to students to fill in during presentations. This helps students listen for key information and see the relationships among concepts and related information. (Use step-by-step instruction) New or difficult information can be presented in small sequential steps. This helps learners with limited prior knowledge who need explicit or part-to-whole instruction. (Simultaneously combine verbal and visual information) Verbal information can be provided with visual displays (e.g., on an overhead or handout). (Write key points or words on the chalkboard) Prior to a presentation, the teacher can write new vocabulary words and key points on the chalkboard or overhead. (Use balanced presentations and activities) An effort should be made to balance oral presentations with visual information and participatory activities. Also, there should be a balance between large group, small group, and individual activities. (Emphasize daily review) Daily review of previous learning or lessons can help students connect new information with prior knowledge. (Change response mode) For students who have difficulty with fine motor responses (such as handwriting), the response mode can be changed to underlining, selecting from multiple choices, sorting, or marking. Students with fine motor problems can be given extra space for writing answers on worksheets or can be allowed to respond on individual chalkboards. (Provide an outline of the lecture) An outline enables some students to follow the lesson successfully and make appropriate notes. Moreover, an outline helps students to see the organization of the material and ask timely questions. (Encourage use of graphic organizers) A graphic organizer involves organizing material into a visual format. To develop a graphic organizer, the student can use the following steps: (a) list the topic on the first line, (b) collect and divide information into major headings, (c) list all information relating to major headings on index cards, (d) organize information into major areas, (e) place information under appropriate subheadings, and (f) place information into the organizer format. (Place students close to the teacher) Students with attention problems can be seated close to the teacher, chalkboard, or work area and away from distracting sounds, materials, or objects. (Encourage use of assignment books or calendars) Students can use calendars to record assignment due dates, list school related activities, record test dates, and schedule timelines for schoolwork. Students should set aside a special section in an assignment book or calendar for recording homework assignments. (Have students turn lined paper vertically for math) Lined paper can be turned vertically to help students keep numbers in appropriate columns while computing math problems. (Use cues to denote important items) Asterisks or bullets can denote questions or activities that count heavily in evaluation. This helps students spend time appropriately during tests or assignments. (Design hierarchical worksheets) The teacher can design worksheets with problems arranged from easiest to hardest. Early success helps students begin to work. (Allow use of instructional aids) Students can be provided with letter and number strips to help them write correctly. Number lines, counters, and calculators help students compute once they understand the mathematical operations. (Display work samples) Samples of completed assignments can be displayed to help students realize expectations and plan accordingly. (Use peer-mediated learning) The teacher can pair peers of different ability levels to review their notes, study for a test, read aloud to each other, write stories, or conduct laboratory experiments. Also, a partner can read math problems for students with reading problems to solve. (Encourage note sharing) A student can use carbon paper or a notebook computer to take notes and then share them with absentees and students with learning problems. This helps students who have difficulty taking notes to concentrate on the presentation. (Use flexible work times) Students who work slowly can be given additional time to complete written assignments. (Provide additional practice) Students require different amounts of practice to master skills or content. Many students with learning problems need additional practice to learn at a fluency level. (Use assignment substitutions or adjustments) Students can be allowed to complete projects instead of oral reports or vice versa. Also, tests can be given in oral or written format. For example, if a student has a writing problem, the teacher can allow her or him to outline information and give an oral presentation instead of writing a paper.